You are like some kind of mechanical device, constantly ticking away at the hours, minutes and seconds of every day. Indulging yourself ravenously in an array of thoughts laid out like a buffet at the finest of restaurants. You are always the last one to leave, making sure you have devoured every last crumb. So much of our time is spent and wasted, deeply deliberating and contemplating, wondering about the processes of our thinking. It all seems so real, all of that noise inside of our heads. No matter where we go, you are always tagging along. Like an unwanted guest that we had no choice but to invite to our social gathering, there you are, whether we like it or not. Times when we despise you and need to get as far away as we can, there you are! You couldn’t care less about boundaries—there are no limits or dividing lines to the mess you cause sometimes. What were you thinking the other day when that person was so upset and all you could do was think about yourself—you disgust me sometimes. So many of us battle with our constant, unappeasable and insatiable appetite for drama, and you are impossible to satisfy. You are not anyone’s friend, you can’t be trusted, we can’t rely on you, and you certainly don’t see the good in anything. You resonate only in negative, fear-based, pessimistic, cynical energy, and very seldom do we hear an optimistic attitude from you. A constant uttering of statements that only express denial, disagreement, blaming and “poor me” implications. Honestly Ego, you have a tendency to drive people to the brink of madness. You are like an LP record, spinning around and around on the turntable with a broken needle, and that terrible scratching noise is torturous. 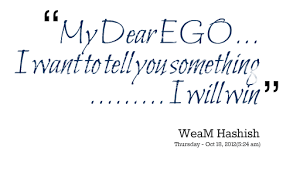 Well, dear Ego of the Mind, we want you to know, we have decided not to take your substandard, inferior, miserable and very defective crap anymore. Everything you “say” to us doesn’t belong to us anyway. Your data is never reliable and we are tired of your incompetence—constantly providing incomplete and irrational thoughts is no longer acceptable. We all got together and we have figured out how to shut you down, turn you off and kick you out of our life once and for all. We, the collective have decided to MEDITATE!! So take that, you despicable Ego.